DMX512 to RC servo controller. Northlight's RC servo controllers will receive DMX512 digital protocol for Stage lighting products and controls 8 RC hobby servos. Our controllers have rock stable output, no jitter at all. No complicated setup, basically the board is plug and play. Easy to use screw terminals, just add power supply. There are 2 options shown below. Select a switch type when ordering. The Mini DIP switch is mounted on the circuit board. Use this when infrequent address changes are needed. The address is entered in standard binary code, starting with 1. The Mini DIP switch is mounted on the enclosure panel. Includes powder coated, alminum mounting plate. 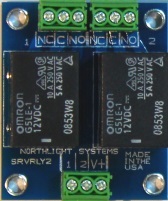 Includes LED and connecting lead. 8 Channel RC servo controller. Small size 2.30" X 1.50". 8 RC servo channels, starting at the selected address. Separate power input for servo's. Screw terminals for controller power and DMX input. Works with 5 volt power supply. ESD protected receiver, fail safe features in receiver chip..
8 bit, 1 DMX channel per servo. SRV08M -- 8 Channel servo controller with on board address switch. To Purchase: enter quantity, then click "add to cart". SRV08P -- 8 Channel servo controller with panel mount address switch. 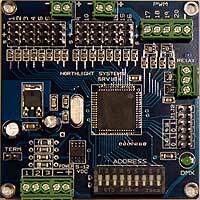 SRV16 -- 16 Channel servo controller with 4 PWM channels and 2 relay driver channels. 4 pulse widths to choose from. 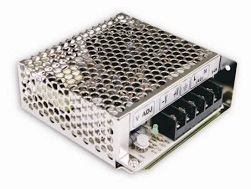 4 low power, high speed PWM drivers. 40mA per driver for LED's. 2 relay drivers on board. For mechanical or SSR. 8 bit, 1 DMX channel per output. Work with 5 volt power supply. SRV16M - 16 channel servo controller with on board address switch. SRV16MP -- 16 Channel servo controller with panel mount address switch. To Purchase: enter quantity, choose shipping, then click "add to cart". SRVRLY2-- 2 - 10 Amp, 120 Volt relays for use with SRV16 controller. 10 Amp mechanical relays for use with SRV16. Free shipping when purchased with SRV16. To Purchase: enter quantity,then click "add to cart". MEAN WELL S-25-5 , 5 Volt 5 Amp power supply. Output adjusted to 5.75 Volts. Free shipping when purchased with SRV08, SRV16. Free shipping when purchased with servo board.